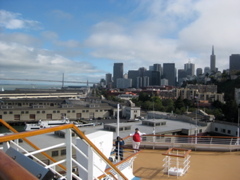 The Sea Princess left San Francisco around 5 pm from Pier 35 on Sunday September 19, 2010. 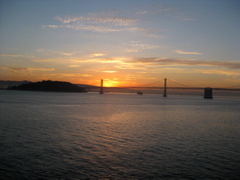 We were all on desk to see the ship sail out under the Golden Gate Bridge. Click here for pictures of the Sail Away. 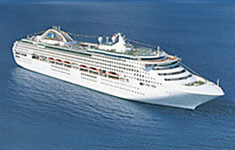 Picture of the Sea Princess from the Princess website. Saturday in Tracy Arm was pre-empted by weather so we cruised the Canadian Inland Passage instead. While we were disappointed to not see Tracy Arm, it was preferrable to being caught out in gale force winds and hurricane force wind seas. 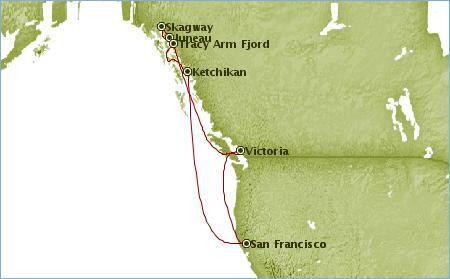 We ran fast from Skagway down past Ketchikan, hugging the coast and using the islands as wind breaks. We were briefly caught by the front of the storm as we entered the ocean when moving from the Alaska Inland Passage to the Canadian Inland Passage. Aside from that it was not at all bad for us. Other ships were not as lucky. Cudos to our Capitan for his manuevers. We live in a lovely place. It is good to be home!